It’s the biggest UFC middleweight fight since, well, champion Chris Weidman last defended his title in July by beating Lyoto Machida. After plenty of drama, Weidman and Vitor Belfort will finally stand across the cage from each other. 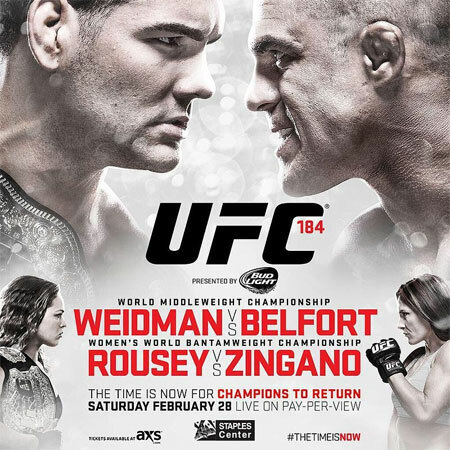 UFC 184 takes place February 28 inside Staples Center in Los Angeles, California. As you can see from the official billboard above, that won’t be the only gold up for grabs in So Cal. Bantamweight queen Ronda Rousey defends her throne against Cat Zingano in the co-main event. As long as everyone can remain healthy, the rest of the card is pretty stacked, as well.